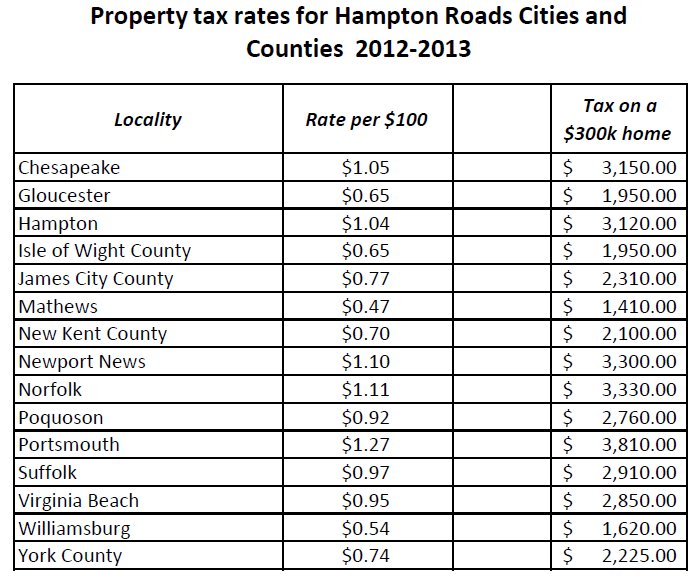 With many localities in Hampton Roads looking to raise property tax rates I thought I would post the current tax rates. You can see in the chart below that rates range from a low of .47 per $100 of home value in Mathews to a high of $1.27 in Portsmouth. Here in James City County we enjoy a very reasonable rate of .77 per $100 that will not increase for 2014 according to our proposed budget. The adjacent City of Williamsburg offers a .57 tax rate. . You can see from the chart the differences in annual taxes on a home valued at $300,000 in area localities can range from $1410 in Mathews County to $3810 in Portsmouth VA. . A monthly payment difference of $200.00 if you have a mortgage ! Note a few of these localities have slightly higher rates for their business districts.